Well, we're certainly off to an interesting start with this panel of "experienced experts". Expert thieves is what I'll call my own two, who seem to have located the shelf where samples to be reviewed were stored. :( You probably know what that means. They've been reprimanded and Tanner refuses to take off the sunglasses. Tsk! We'll forge ahead anyway, making do with what we managed to get shots of. Note to self: Use a higher shelf for treat storage. BIG NOTE TO SELF!!!! Now then, I bet you'd love to hear about Dog Pack Snacks. Our friend Deb and her pup Cocoa have been very active on Twitter and Facebook, making sure we got all the great info we need to pull this review together. She sent wonderful yummies that the dogs all loved. I'll fill you in as we go along. My first two choices for review were the Chicken Jerky and the Turkey Chips. I envisioned a replacement for rawhide that would be more nutritious and appetizing. Tanner and Oliver agreed, despite Oliver's struggle with the Chicken Jerky. Oliver has the tiniest mouth on the planet, according to his vet. His teeth are like little specs of diamonds from a promise ring. But after about a a half hour, he finally emerged from his corner, satisfied that he had demolished the Jerky without asking Tanner to help. Wouldn't that be against some sort of dog code of ethics or something? Reports from the whole team were excellent, with everyone especially loving the Turkey chips which were a bit easier for all the pups to crunch up and chow down on. I guess we'll call that the paws-down favorite. We also tested a hearty sample of the Mac-A-Doodles. These smelled good enough to eat myself, but I did manage to hold back and let the dogs do their thing. They were highly appreciative, even though I did serve them like a dessert at a banquet. I don't think they cared! 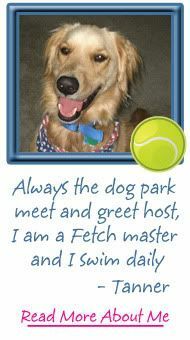 Let's share a few tidbits about my new friend Deb at Dog Pack Snacks. 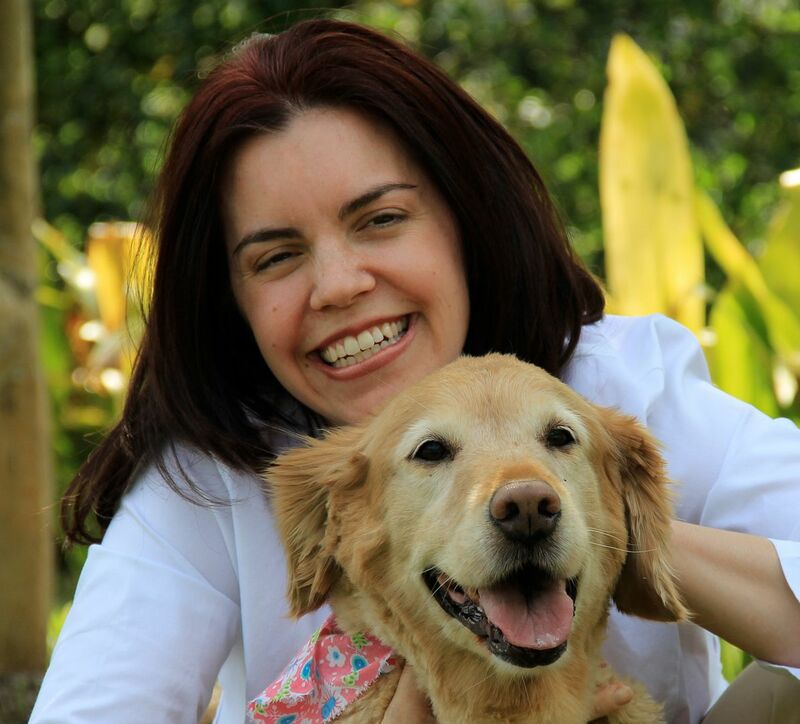 She's the face behind the company, along with her dog, Coco. 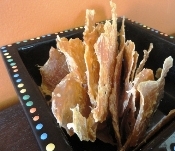 For years she's been making dog treats of all sorts to share with friends and neighbors. 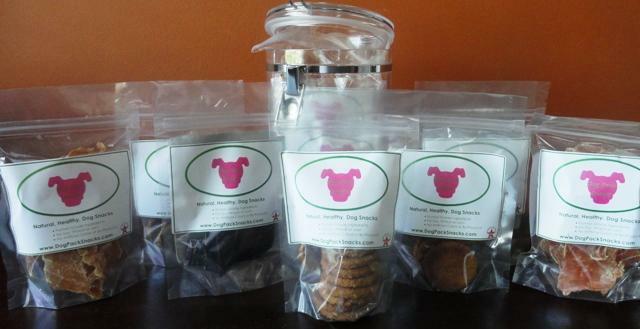 Now, with the birth of Dog Pack Snacks, she's sharing 20% of her profits with a local, no-kill animal rescue. That's a cause we can all get behind. Imagine giving your own dog a delicious, low fat, high protein, healthy treat, and knowing that while you're doing this, Deb is adding up her profits and writing a check to the rescue. Doesn't that just give you a good feeling inside? Speaking of inside, let's talk about what's NOT inside Dog Pack Snacks: wheat, corn, soy, by-products, sugar, salt, or artificial preservatives or colors. The company is licensed by the Florida Department of Agriculture and meets all applicable labeling guidelines, so your freshly-made snacks will come with a guaranteed analysis, certified by a lab, labeled on the package. Dog Pack Snacks also has a "frequent flyer" club called Club Coco, after Deb's dog, of course. There's no cost to participate in Club Coco, but there are plenty of benefits: twice monthly coupons, instant savings on your first order, news and giveaways, and a faster checkout process. Sounds good, right? Shall we give you all a chance to try some of their great treats? Deb has graciously offered to treat (pun intended) four of my readers to 2 bags each. You can even pick your flavors from these choices: Chicken Jerky, Liver Snaps, Turkey Chips or Mac-A-Doodles.. Two bags of these delish doggie decadence and you and Fido will be hooked for life. I get brownie points for bringing you to her door too! You may enter the giveaway once daily per method, but you must use a different Tweet, comment, photo, etc. each time. 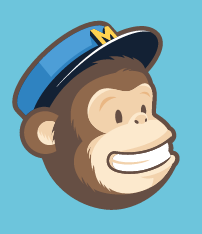 COMMENTS are the primary form of entry--super simple since you're already here. Visit the bottom of the post to find the COMMENTS link and click. Winners are selected from comments here on the blog that include a method of contact (URL, email, Twitter handle, etc). All Tweets and emails must be followed up with a comment here to be entered in the drawing. Random.org will be used to select the winners. For 3 entries, drop me an email at AllThingsDogBlog@gmail.com with a photo of your pup and a sign that says "We Love Dog Pack Snacks ". You can print the picture at the top and write the note on the photo for an extra entry. That's 4 entries right there! 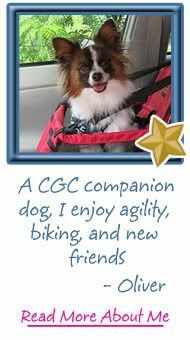 Your photo may even be featured on our Facebook page, Dog Pack Snacks Facebook page, or here on the blog. 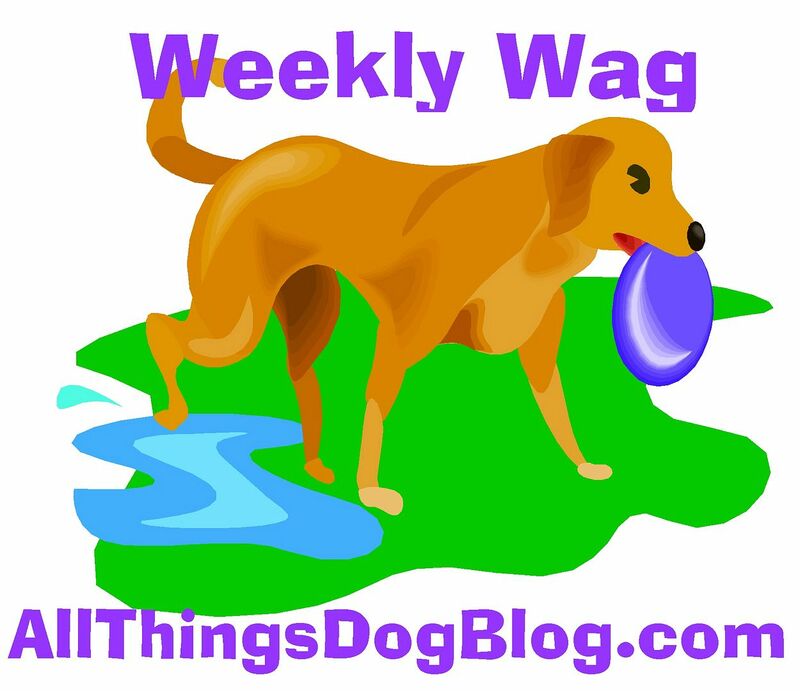 Leave a comment here saying "I Like All Things Dog Blog and Dog Pack Snacks on Facebook" for another entry. Likewise, follow @DogPackSnacks on Twitter and leave a comment here telling me you've done this. Subscribing to our blog by email using the dog house subscription box at left is a great way to keep up with our posts, giveaways, Ask the Vet and Trainer columns and more. 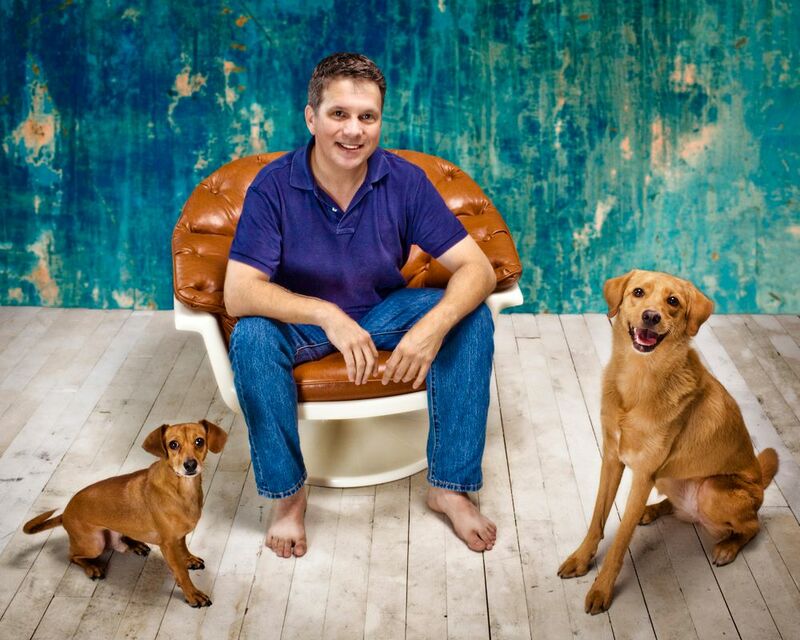 Leave me a comment for one entry, saying "I subscribe to All Things Dog Blog." RSS subscribers may use this method also. 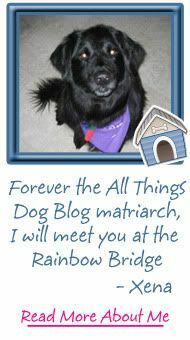 Tweet "Thx @AllThingsDog 4 connecting us up 2 the @DogPackSnacks' Club Cocoa Discount" Don't forget to leave me a comment that you've tweeted. And of course, hit that Tweet/Retweet button at the top of the post, and then leave me a comment telling me you Tweeted/Retweeted this post. Leave your Twitter handle for verification and we'll be thrilled to give you another entry. Don't forget to include a method of contact so we can notify you if you win. Entries will close at 5 PM sharp on Thursday, July 7th. I'll report the winners on Friday, July 8th. That's always a mouthful, but we sure do have fun watching the comments fly. Join in and see what a great time we have. I'll invite Coco to make an appearance on our Facebook page. She's got cool shades too. Maybe Tanner and her can face off! Don't miss it. PS--Other yummies we tried and loved: Buffalo Chips, Liver Snaps, and Buffalo Chicken Bites. Be sure to check 'em all out at their site. And if you missed the introduction to our Treat Review Team's dogs, please visit their post here. It's always fun to know who is giving the input. It certainly isn't me! Full disclosure: Dog Pack Snacks provided samples of a number of products for our Treat Review Team to try. We were not paid to do this product review and the opinions provided herein are our own. Please enter Mindy and Jewel for A. Martin. Email on file. Awesome.. lots of giveaways.. and treats! also tweeted about the giveaway! My dog is very special to me he deserves the best treats because of that. "I subscribe to All Things Dog Blog." Torrey and Roxy love tasty treats. They would love to sink their teeth into these. Peanut and Dolly would love it!! I subscribe to All Things Dog Blog. My pups would LOVE these treats - they look great! I would much prefer buying my dog treats from Dog Pack Snacks to aid their charitable efforts than give the money to Wal-Mart but I would like to make sure that my picky dogs will eat them first. Winning this prize would really help! My previous blog isn't showing up so I don't think it got entered.